Ed note: the section on prong collars may evoke strong negative reactions. Please note that they are useful for those few greyhounds who don’t respond quickly to leash training with normal collars. 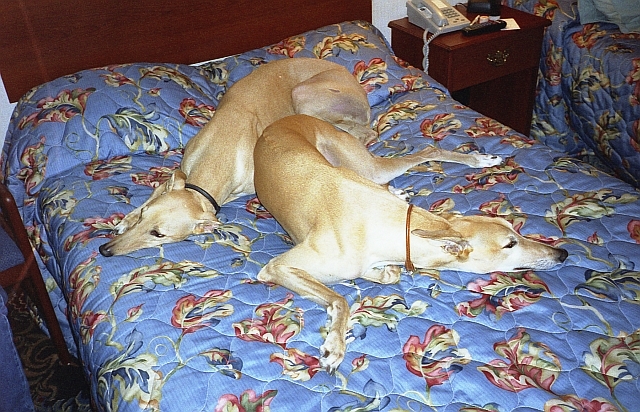 A time or two with a prong collar on is all it takes; they do NOT harm the greyhound. 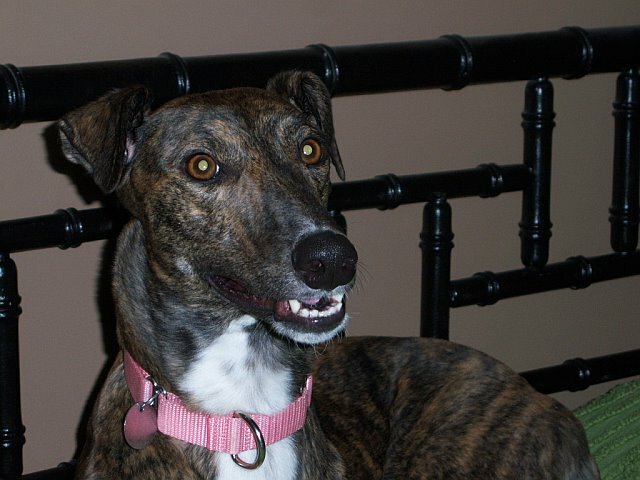 The vast majority of greyhounds wear a collar. 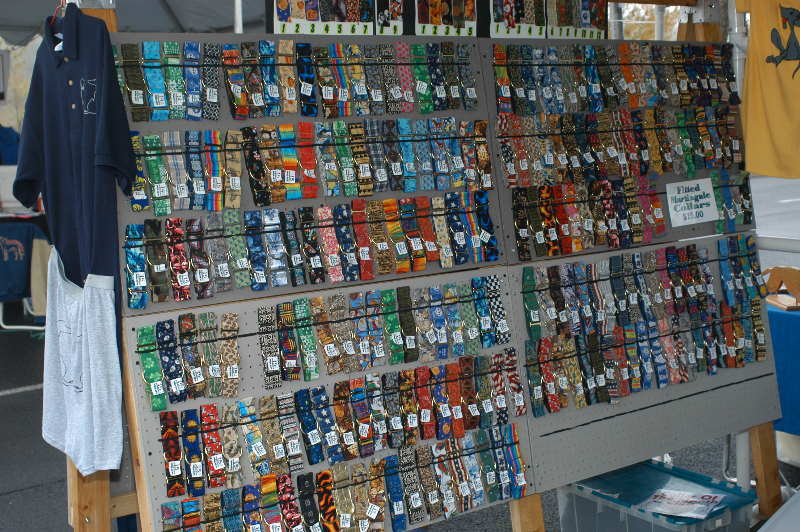 Some of these collars hold identification tags; some are used on walks; and some are simply decoration. If you adopted your greyhound, odds are the adoption group gave you a collar when you received the dog. Your group may have even warned you against using any other type of collar than the one they gave you. Those pursuing serious obedience with their greyhound may choose to use a collar that others find inappropriate. 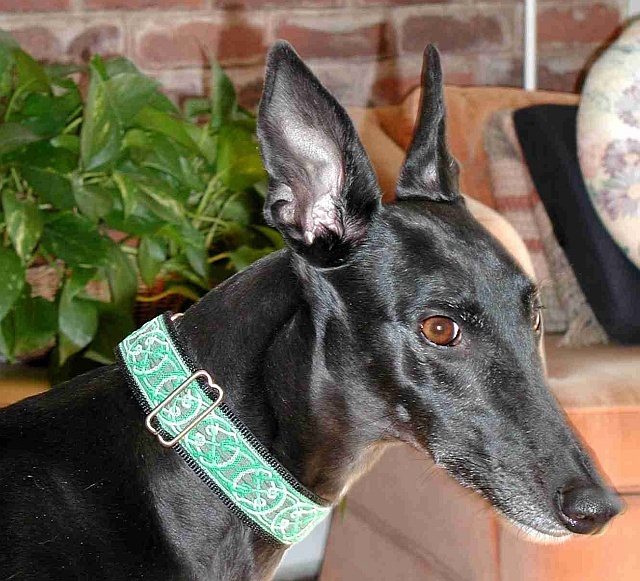 People who course their greyhounds may find a different collar suits their tastes and needs. Everyone seems to have an opinion about greyhounds and collars. Some of these opinions are based on experience and observation, while others are based on myth. The truth is, there is no single type of collar that is solely appropriate for a greyhound to wear. Greyhounds can and do wear different types of collars, from pinch to slip to flat buckle. A collar is nothing more than a tool used to gain control over a dog or to carry identification tags. The tool itself is not evil or bad; it’s the misuse of the tool that can create serious consequences for the dog or owner. It is the owner’s responsibility to learn about the correct fit and use of a collar. Whichever collar you decide to use on your greyhound, it must fit properly. A poorly fitted collar will fall off a greyhound or allow the dog to back out of it at an inopportune time. This is a grave safety issue for owners to understand and accept. One of the initial decisions you will have to make is whether or not your dogs will wear collars while in the house. Many owners keep loose fitting flat collars on their dogs while in the house or crate. These collars hold identification tags and are loose enough to allow the dog to escape if the collar becomes hooked onto a crate or a second pet’s jaw during play, or on other objects. Other owners prefer to keep a tighter fit collar on their dogs while at home, and still others prefer the safety of no collar at all. While house collars may be loose fitting, collars used for walks must be adjusted correctly and fit snugly on the dog’s neck. 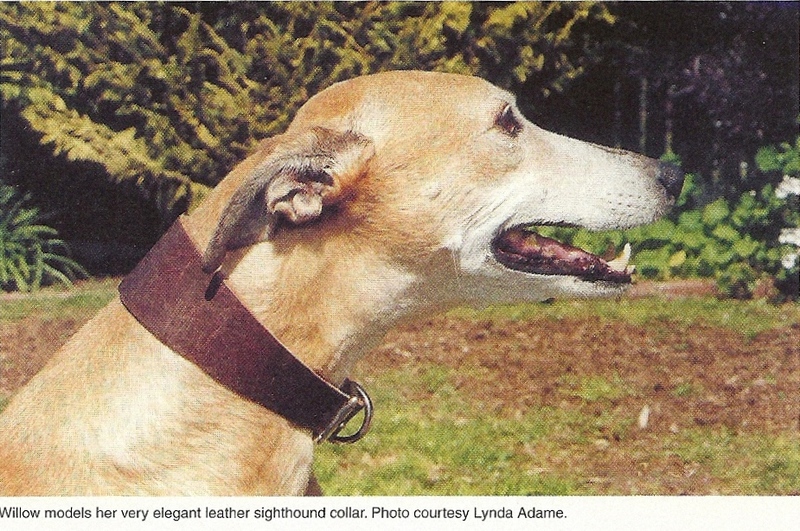 A properly adjusted collar, used for walks, will sit higher on a greyhounds neck than is normally seen in other breeds of dogs. The difference in diameter between a greyhound’s large neck and small head requires this snug fit. As for actual size of collar to purchase, there are two considerations. If you purchase the martingale style, no measuring is required. One size can fit puppy through adult. A buckle collar requires measuring your dogs neck. Collars have a two inch adjustment range. The large size usually fits a 14 to 16 inch neck. 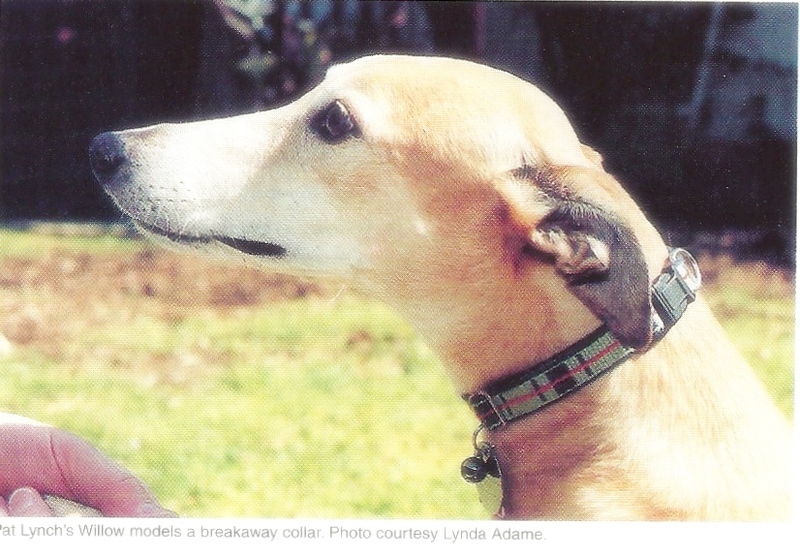 Martingale collars are the collars of choice for most greyhounds. They are readily available in all colors, sizes, materials and even backings and hardware. A well-made collar will last for many years and the hardware will hold up. One of the more popular collar styles found on greyhounds is the Martingale, or modified Martingale. You may hear some people refer to these as “Premier” collars although they are technically martingale-style collars produced by these and other companies. 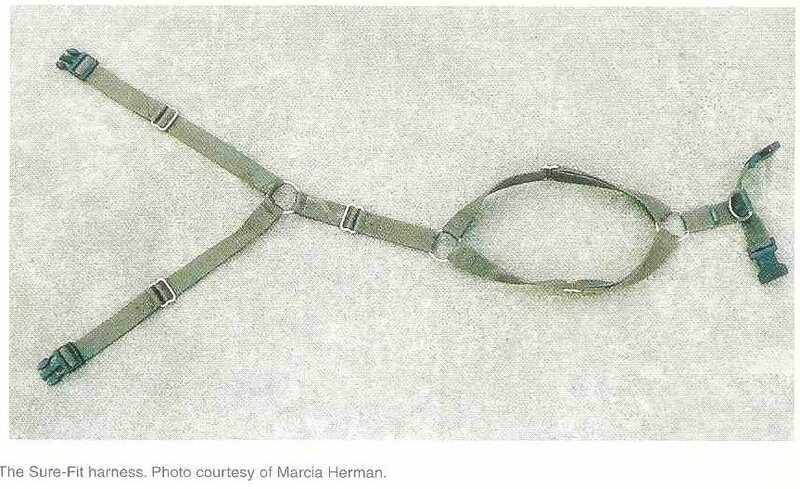 Martingale collars have an adjustable loop built into them. The dog’s leash attaches to the adjustable loop portion and pulls it tight as pressure is applied. Properly fitted, the two metal D-rings should not touch when the adjustable loop portion pulls tight at the top of the dog’s neck. 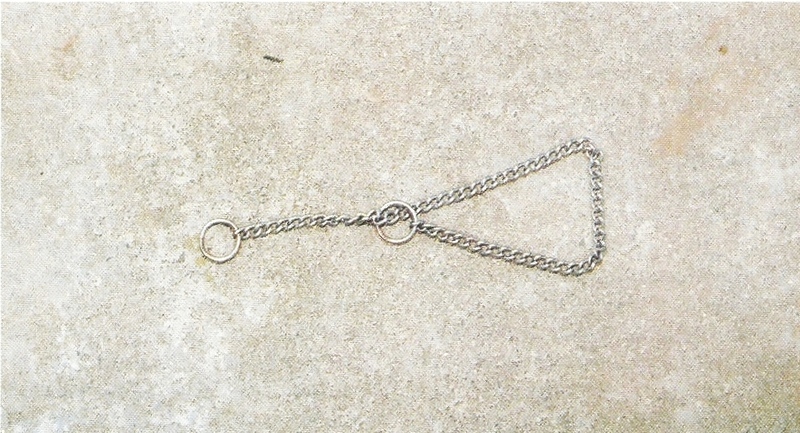 If the D-rings touch, or are closer than one half inch from each other, the collar is too loose and should be tightened. These collars are typically used when walking a greyhound on a leash. Please go to this page for details on how to adjust a Martingale collar. These collars come in standard widths. Three-quarter inch width collars are a good greyhound width. Katy shows off her new Martingale collar. Note the correct placement of her tag – not on the D-ring for the leash. Flat buckle collars are exactly what they sound like — a length of flat material with a buckle. Made of nylon or leather, these collars adjust via a manual buckle system. In racing kennels, greyhounds wear flat buckle collars encased in plastic. The plastic coating allows the snug fitting collar to slide over injury sites without irritating the wound or wearing fur off the dog’s neck. Another variation of the flat buckle collar is the rolled leather collar. Instead of a flat piece of leather, the leather is rolled up and is very comfortable to wear. Breakaway collars are flat collars with a plastic snap in place of the buckle system. The plastic snap pulls apart if pressure is applied, allowing the dog to free itself if it becomes hung up on an object. Breakaway and flat buckle collars are commonly used as house collars to hold identification tags. See photo on previous page. Sight hound collars are typically made of leather, although they can be found made out of foam or padded material as well. These collars have graduated widths, with the back of the collar being 2 to 3 inches wide, narrowing down to 1 inch at the buckle. These sit snugly on a greyhounds neck, accentuating the graceful arch. When correctly fit, these are extremely difficult to remove without unbuckling the collar and thus may not be safe for dogs to wear while alone in the house. 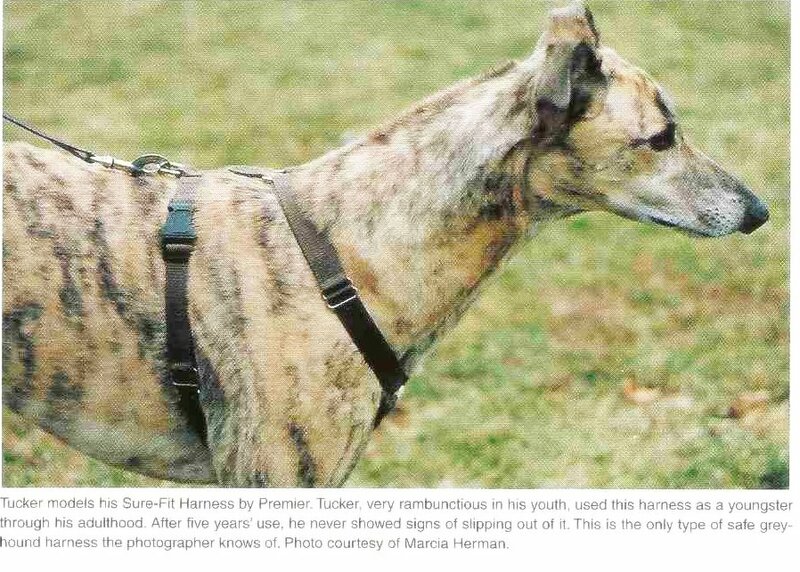 Sight hound-style collars have traditionally been used on hunting or coursing greyhounds. When a leash is attached, the wider portion of the collar swings to the front of the dog’s neck. The wide portion in front keeps the dog from cutting off his arterial blood flow and breath when he is straining forward after the hare. 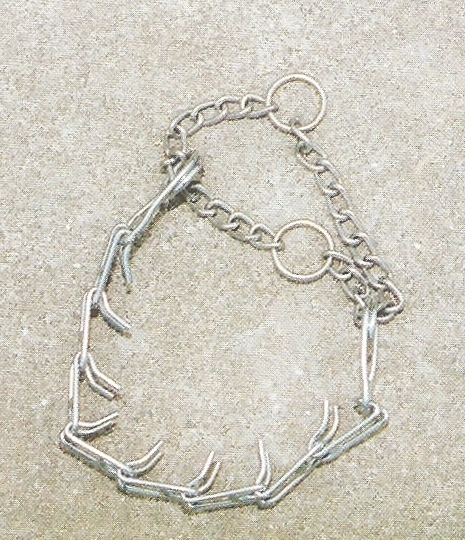 Choke collars are used by many owners who do obedience work with their Greyhounds. Many obedience instructors require them for class use. Chokes can be nylon or metal and afford the owner a greater degree of control than a flat buckle collar. These collars can tear a greyhound’s delicate skin if used incorrectly. Many instructors do not require them for greyhounds or other thin-skinned hounds for this reason. Pinch collars are commonly referred to as prong collars. Surprisingly, if used correctly, these are effective collars to use on a greyhound that is physically strong or just strong-willed. I recommend that you purchase the smallest links available and learn how to use this collar correctly. To soften the correction, you can purchase this collar with rubber tipped prongs, or use a hair scrunchie to cover the prongs. The prong (or pinch)collar is used on dogs who have great trouble learning to wlk on a leash without pulling. It’s a lot less nasty to use than it looks. Try it on your arm. Haltis are worth considering if you have a greyhound that pulls on the leash, has a very high prey drive, or is dog aggressive. Haltis, also referred to as Gentle Leaders, resemble a horse’s halter. One portion of the Halti works as a plain buckle collar, worn at the top of the neck. The other part loops around the dogs muzzle. The leash attaches to a ring at the bottom of the muzzle loop. When the lead tightens, it applies pressure to the top of the dogs muzzle and the back of the neck. The pressure applied will actually redirect the dog’s head towards you and away from where it is pulling. Haltis afford the best control an owner can have over a dog. There is an adjustment period needed for this device, where the dog becomes familiar with wearing it and the owner educated in the proper fit and use of the Halti. Harnesses come in many styles and variations. There are tracking harnesses, carting harnesses, sledding harnesses, plain buckle harnesses, No-Pull harnesses, and spook harnesses, some of which can be viewed as martingale harnesses. The Sure-Fit harness is a safe harness from the standpoint of escape and wearability; greyhounds wear them quite comfortably. Premier is a prominent manufacturer of quality safety collars and leashes and their harnesses are no exception. The webbing is substantial. The harness has two squeeze fasteners that are attached to two straps that go under the dog and then come up and meet two more fasteners at the tops of the shoulders. They attach up there. The webbing and belts are infinitely adjustable and dogs do not escape from this type of harness. Even better, you may attach a “Car-Control” strap to your vehicle’s seat belt for added security while traveling with your hound. Each type of collar, harness, or halter device listed in this article has its own pros and cons associated with it. Some of the cons to be aware of are: nylon collars tend to stretch out when they get wet; leather collars can be stiff; dogs can catch their lower jaws in the adjustable loop portion of martingale collars; some harnesses are easily shed. Any of these devices can cause serious neck injury if misused or ill fitted. Greyhounds can wear any type of collar. It is up to the owner to decide which one will work best in any given situation. Note: For even more nifty information and photos about collars, harnnesses, and head collars please visit Collars and Alternatives.